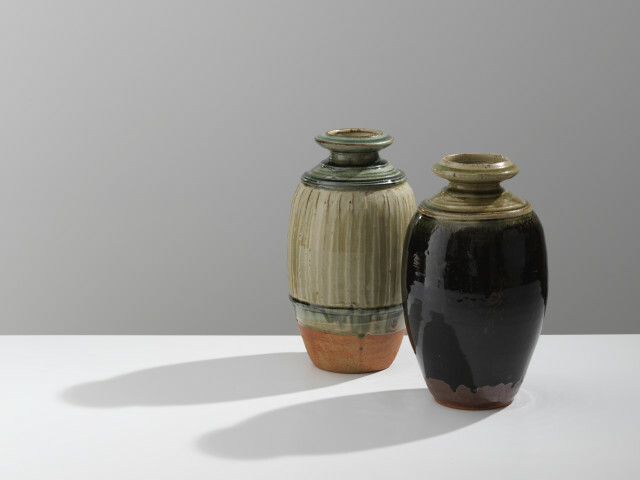 Richard Batterham is one of the finest potters to have trained with Bernard Leach in St Ives, but his work has a quiet modernity of its own, distinct from the more oriental overtones of many in the Leach School. Restrained and economic in form and surface marking, Batterham concentrates on understated but rich glazing on shapes so refined over the years that his ash and iron glazed jugs, large dishes, bowls and lidded jars have become some of the hallmark pots of the last fifty years, instantly recognisable. Born in 1936, Batterham establisheda pottery at Durweston, Dorset, after leaving St Ives. He has been here ever since, producing work, which in its understatement and colouration, has a distinctive Englishness that appears to emanate, more than anything else, from the native seasons and landscape.